There are many different structural elements that make up a roof. The roof framing is the structure that supports your roof. The main decision that needs to be made with erecting a roof is which material to use for its construction: timber or metal. Timber is by far the most common material for house framing in Australia. This is largely due to price - a timber frame is significantly cheaper than a metal one. 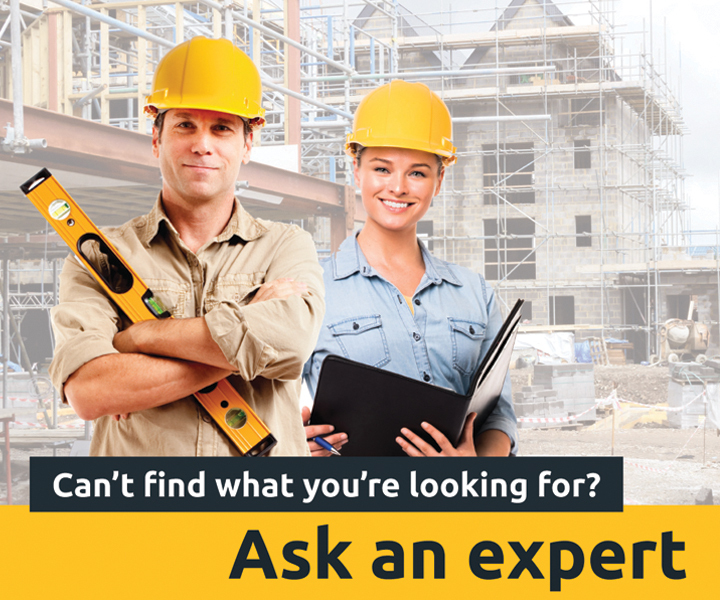 As a result there are a lot more tradesmen who work with timber frames and the competition reduces prices even further. A metal frame is stronger and will stand up better to natural disasters such as fire, strong winds and earthquakes. Although a steel frame may corrode in coastal areas, metal won’t warp or rot and is resistant to termites. Additionally, a steel frame's greater load bearing capacity may also eliminate the need for internal loadbearing walls. Steel and aluminium are recyclable and, unlike timber, are often cut to the correct size before they reach the building site, reducing waste. In most modern construction, things like trusses and other large framing elements are assembled offsite and then transported to the building site. Ceiling joists are the lengths of timber or metal that the ceiling is attached to. Collar ties are elements that are fitted between rafters to prevent them from spreading apart. A fascia board is attached across the end of the rafters to disguise them. Hanging beams sit at a right angle directly above ceiling joists. They are attached to the ceiling joists by metal hoops or brackets. Their main purpose is to support the joists and allow for shorter joists to be installed. A hip rafter extends from the wall plate to the ridge in the angle of a hip roof. 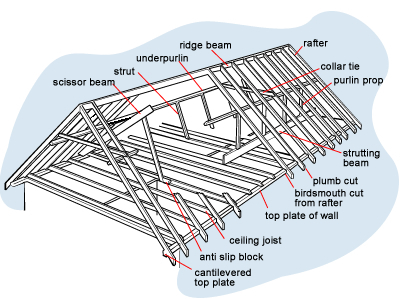 A purlin is a horizontal piece of timber or metal which supports the roof’s rafters or decking and helps to prevent your roof from sagging. Rafters are sloped beams that run from the roof’s ridge to the eaves. They provide the support for the external roofing material. Ridge beams are long, rectangular, rigid pieces of wood, metal or stone which are placed horizontally along the ridge of the roof. Roofing battens run across or down a roof (sometimes both) to provide a fixing point for roofing cladding materials such as tiles or shingles. Soffit bearers sit between the wall and the fascia, providing a base for the soffit lining to be fixed to. Struts and props are vertical elements which support and transfer the load from the purlins to the strutting beams. Strutting beams support the roof members where there are no load bearing wall studs available. They transfer the load of the roof to load bearing walls. Strutting beams should only support roof loads, and not be used as ceiling joists. A top plate is nailed to the top of wall studs. This is the plate that the roofing elements sit on, and effectively the meeting point of the walls and the roof structure. It supports the roof load and helps transfer it down load bearing walls and into the foundations. A truss is a piece of framework using triangular shapes. Roof trusses are generally fabricated offsite, reducing price and speeding up the construction of your roof frame. Roof trusses provide support for the roof deck, the framing and counteract wind load. A valley rafter extends diagonally at a 45° angle from the inside corner of two intersecting wall plates up to the ridge of the roof.